Well, if the vet is sure that he's headed for kidney failure, he might be able to teach you how to do subcutaneous water injections, because if/when he starts taking a turn for the worse, those will help him more than any given food would. As a general rule, you want to make more opportunities for your cat to drink on his own as well, if he's in relatively good health. Wet food would be better than dry food, but beware: some wet foods are just full of byproducts that could cause other problems with a cat his age, so I would ask your vet for advice about specific brands of food you might have in mind. First I would suggest you check all of these links: http://www.catster.com/forums/Cat_Health/thread/384051 There are many organizations that can help with medical bills if you can't afford them. Without bloodwork, it is hard for the Vet to know exactly what's happening. I lost a 13 year old to kidney failure myself. They put Nikki on lasix for a week, because she was so bloated she looked ready to pop. It's very sad to see them go through this. The only thing you can do really is give her canned foods, no dry at all and keep a close eye on her. There are prescription foods the Vet can give, but again it depends on the bloodwork. I truly hope one of the organizations can help you get financial help so you can really know what's happening. My cat is in early stages of kidney failure & I'm doing: Giving rehmannia 8 a chinese herb from vet known to reverse kidney failure. Feeding a raw meat diet (check out www.petgrub.com or other sites) Stopped promoting dry food. It dehydrates cats. So feed good quality wet food without pork and the first ingredient should be meat. White meat like turkey, chicken is best for these cats as the protein is easier on the kidneys. Don't feed red meat. Dehydration & weightloss & your biggest concerns. I haven't taken the dry food away. I want to make sure he eats and don't want to disrupt the diet. But he doesn't want it anymore. If he is losing weight and active and eating a lot have his thyroid checked. The tests for kidney failure are both urine (concentrating ability) and blood (creatinine and urea). Hopefully you can find the money somewhere and get the tests you need and if it is thyroid and it is not too late, radioactive idodine treatment is curative but extremeley expensive. While it's true that only a blood test can find out for a certainty if your kitty has crf (chronic renal failure), there are certain symptoms. One is the large amounts of urine produced with corresponding large amounts of water drank. But that's also true of diabetes. With crf, there's weight loss, constipation, scruffy looking fur & loss of appetite - all symptoms too. Please go to http://www.felinecrf.org to read more & learn lots. 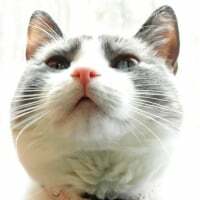 There is also an excellent Yahoo group that helps other crf kitty owners at http://pets.groups.yahoo.com/group/feline-crf-info/ Please join & you'll find lots of help & suggestions there. With no savings & little resources, I was able to care for my crf cat for over 2 years (with very good quality of life) until other problems meant I had to have her pts. My vet was thrilled & surprised at how well she did. If you treat early (I didn't know what it was at the time), he could have a lot of good quality time, in happiness, with you still. Please join!